POST-HURRICANE UPDATE: This particular unit weathered the storm. We now have WiFi! Enjoy our studio unit located in Sapphire Village Condominium development! 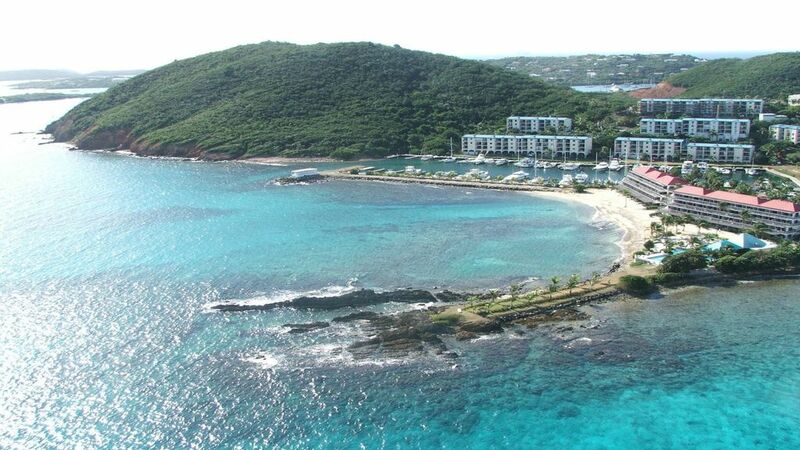 Our unit is smoke-free, pet-free, fully air conditioned, and offers breathtaking views of neighboring USVI and BVI. You will have access to the pools on property, a BBQ, coin laundry located near management office, and steps away from Sapphire Beach. There is parking available directly in front of the unit. You will certainly enjoy the new restaurant on property, Slice VI! On Sapphire Beach, there are opportunities to rent beach equipment and enjoy beach/water activities, at an additional cost. While we have been in the real estate business for years, we have just recently (April 2017) decided to do it in a place that we truly love and have been traveling as a family for several years. We know that you will fall in love with the island as we have. My husband and I are both from the Midwest and really want to make your stay as enjoyable as possible. We have been traveling to the island with our son for several years. We love creating memories as a family and want to pass that on to other families. And when you're not there, we hope to be! So make yourself at home and let us know how we can make your stay more enjoyable. You will absolutely call in love with the views! There is always a nice breeze in the unit, although there is air conditioning if that's what you prefer. The unit is situated in a nice community where you will feel welcome. I pride myself on providing as much help and support to all of my vacation guests. Please let me know if I can help. Not only can you see the beach and the ocean, but you can see other USVI's and BVI's right from the balcony. It's the reason we love the unit! We only stayed one night but we enjoyed our stay. The place was very clean with a beautiful view. The directions and welcome letter was very helpful. Mary was very nice and let us stay a couple of hours longer on the day we were leaving. I would highly recommend this place. Place was very nice. Mary was a super host. Perfect setting, high above the beach overlooking the bay is the perfect location. Very clean, comfortable and met all our needs. Nice Unit in unfinshed building. Nicely appointed condo in St Kitts building. Workers on property still fixing damage. Dumpster and workers vehicles and some work being performed if that kind of thing bothers you. Quick owner and property manager response to questions. The condo is perfect for two people. It is small but has what is needed for a nice getaway. Walk to beach bar, or restaurant on condo property. Beach chairs were nice to have. If you think you want to use washer and dryers get to the condo office to buy tokens before they close on the weekend. The bed was comfortable. Shower was hot. No window treatment so if you can't sleep without total darkness bring eye mask. You can catch a cab at the resort by the beach if you don't have a car. Red Hook is less than five minutes. Even some ok snorkeling off the beach. All over this room offers what you need at an affordable price. Mary was very prompt at all communications. We were even able to get checked in a few hours early and checked out an hour late due to our flight. The unit had all the necessities to make us comfortable. We were only there 2 days but we never left Sapphire Beach. It’s a steep downhill walk to the beach from our unit but the views and the weather made it worthwhile. And you’re only steps away from one of two pools on the property. Would recommend. You will not find better place for the price! Newly remodeled, small but comfortable for two studio, located 5 minutes distance to the beautiful, well maintained Sapphire Beach, walking distance to Red Hook. View from the balcony is breathtaking! Located in Sapphire Beach, Sapphire Village boasts two pools on property as well as a restaurant on-site (Slive VI), 24-hour security, parking, BBQ, and many beach activities (extra fee). Our favorite part about St. Thomas and our location is the proximity to Red Hook and the ferries to other surrounding islands.